Miscommunication is the hallmark of cancer. Normally, our cells are in constant communication, deciding how to share resources, determining the best time to grow, and if necessary, the best time to die. Cancer cells, on the other hand, typically have corrupted these lines of communication, allowing them to grow without limits and selfishly steal resources for themselves. GPCRs (G-protein-coupled receptors) are among the many different molecules of communication that are changed when a normal cell is transformed into a cancer cell. PSI researchers recently surveyed the genetic sequences of many diverse cancer cells and found that problems in the G protein signaling system are very common. Our genome encodes about 800 different GPCRs, and mutations in these are found in roughly one fifth of all cancers. Mutations in G-proteins, the proteins that relay GPCR signals inside the cell, are also very common in cancer cells. In some cases, the expression of a GPCR may be transformed in a cancer cell. For instance, CXCR4, shown here from PDB entry 3odu, is not normally found in breast cells, but is often found in breast cancer cells. CXCR4 normally helps to control the movement of cells in the immune system and during development. But when it's expressed in the wrong place, it can assist the movement of cancer cells, leading to metastasis. 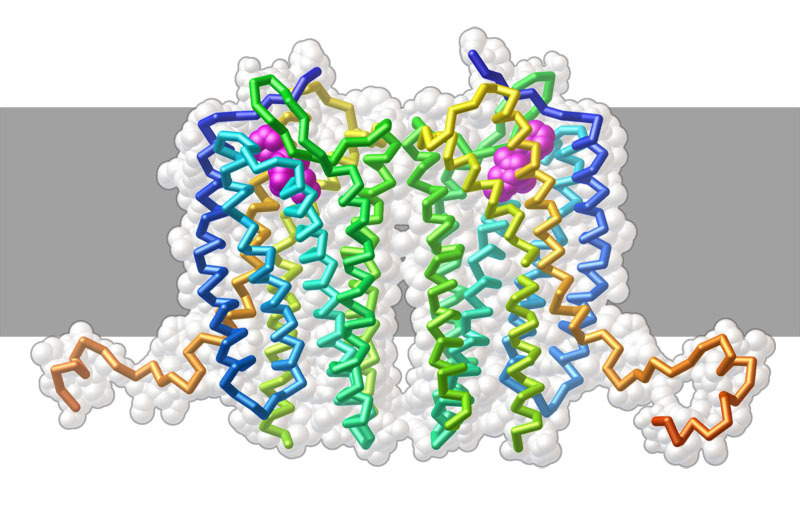 Signaling through GPCRs occurs through subtle shifts of its helices, transmitting a signal from outside the cell to a G-protein inside. These shifts are seen in the two structures of the adrenergic receptor shown here on the left: an inactive form in green and an activated form in red, bound to a G-protein in blue (PDB entries 2rh1 and 3sn6). Two of the helices, shown here in bright green and red, show the largest motions when the signal is transmitted. 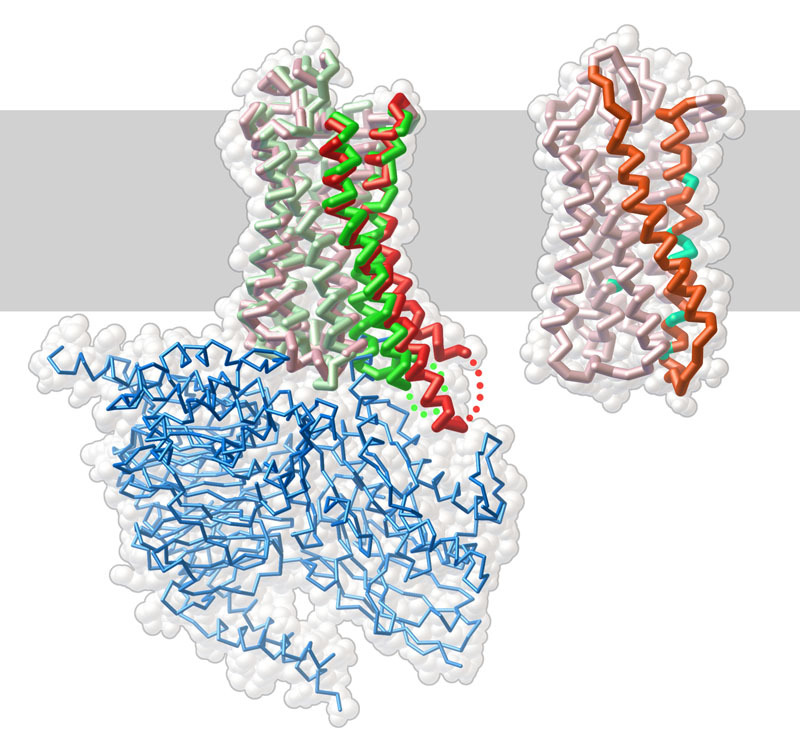 As shown on the model at the right, the most common cancer-causing mutations (shown in turquoise) occur at the interfaces between these helices in a similar GPCR, the human thyroid stimulating hormone receptor, corrupting these essential motions. Based on the PSI survey, the most common cancer causing mutations in G-proteins occur at the nucleotide-binding site of the alpha subunit. Two common sites of mutation are shown here in bright red, from PDB entry 1cul. This small change is enough to unhinge the normal control of the protein, which is usually turned "on" and "off" by the state of the bound nucleotide. To take a closer look at this interaction, the JSmol tab below displays an interactive JSmol. This structure includes the alpha subunit of a G-protein (pink) bound to its signaling target, adenylyl cyclase (blue). 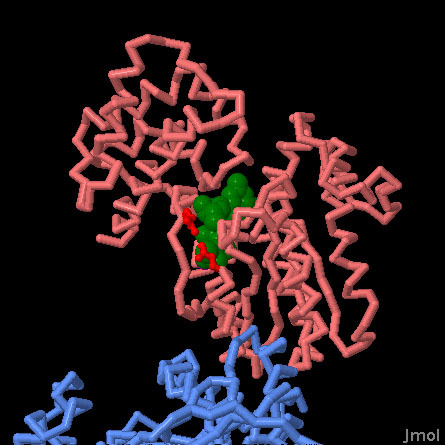 The bound nucleotide is in green. The two amino acids in bright red, which form part of the nucleotide-binding site, are mutated in some forms of cancer. O'Hayre, M. et al. The emerging mutational landscape of G proteins and G-protein- coupled receptors in cancer. Nat. Rev. Cancer 13, 412-424 (2013). Rassmussen, S. G. et al. Crystal structure of the beta2 adrenergic receptor-Gs protein complex. Nature 477, 549-555 (2011). Cherezov, V. et al. High-resolution crystal structure of an engineered human beta2- adrenergic G protein-coupled receptor. Science 318, 1258-1265 (2007). Tesmer, J. J. et al. Molecular basis for P-site inhibition of adenylyl cyclase. Biochem. 39, 14464-14471 (2000).